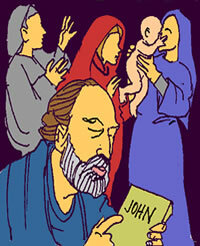 Today’s readings are filled with anticipation of a remarkable life that is very familiar to us – a life looked forward to in the words Luke puts in the mouth of John’s father after his birth: ‘the Lord has raised up for us a mighty Saviour, as he promised through his prophets … As for you, little child, you shall prepare his ways before him’. As we become more familiar with the Scriptures, we recognise the importance of the prophets in the shaping of old Israel’s faith – opening up boundless hopes, and calling them to fulfil their role as ‘the light of the nations’. John the Baptist, the last of the prophets of old Israel, was a figure of immense significance. He was the one who pointed out the way, as the figures and shadows of the Old Testament gave way to their fulfilment, in the life, death and resurrection of the Saviour of the world. As Jesus himself declared: ‘A greater than John the Baptist has never been seen. It was toward John that all the prophecies of the prophets and the Law were leading’. However, what he adds to this remarkable praise startles us: ‘Yet the least in the kingdom of heaven is greater than he is’ (Mt 11:11-14). These words refer, not to John’s personal standing before God, but to the fact that his role belongs to the old order which is now passing away. If he was a figure of the old dispensation, his selfless dedication and final heroism will be an inspiration to Christians of every age. In fact, John was a figure of such influence at the time, that the gospels stress the fact that John claimed to be no more than a humble herald of this fulfilment. In a striking passage of the first chapter of John’s gospel, the Baptist’s witness to Jesus is dramatised. One of the devices used in this gospel, to affirm the divine identity of Jesus, is the frequent repetition in the declarations of Jesus of the phrase, ‘I AM’. Jews came to question this preacher who was attracting large crowds. When asked: ‘Who are you?’ he declared quite openly, ‘I AM NOT the Christ; I AM NOT Elijah; I AM NOT the Prophet (i.e. the New Moses)’. He was, he said, ‘a voice that cries in the wilderness: Make a straight a way for the Lord’. But there are less subtle indications of John’s acceptance of his role as a humble herald. When large crowds came to be baptised, he brushed aside their grandiose suggestions with words that are familiar to every generation: ‘I am not fit to undo the strap of his sandals; I baptise with water, but he will baptise you with the Holy Spirit and fire’ (Luke 3:16). Taking up the prophets’ theme, referring to the Lord as the ‘husband’ of Israel, he applied it to the fulfilment he was announcing, calling himself ‘the bridegroom’s friend, who stands there and listens and is glad when he hears the bridegroom’s voice’. And he makes himself an inspiring model to all disciples of Jesus, declaring, ‘He must increase and I must decrease’.